On another note: Finished watching first season of Misfits and Merlin this week! I lulz Merlin right now! I don't think it's all Anthony Head's fault, but I remember Buffy so much watching it... It's so fun! 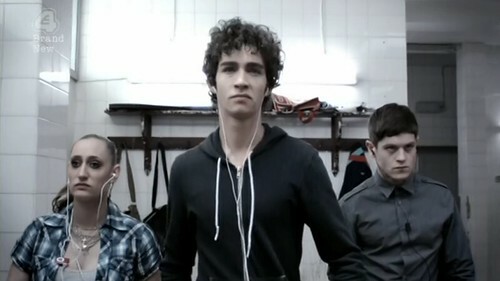 XD And I can't even find words to Misfits, actually... it's ugghh, and I'm cracking up too much watching it! Really, 2 couples going home tonight was harsh! They should have just sent two kids home last week. Ricky earned his spot with that solo bu Nick didn't deserve to go home either. Ryan annoys the crap out of me. She's such an immature dancer, its all pageantry and smiles no real emotion. Personally I liked the ballroom girl hose name I can't spell to save my life. She brought something different to the girls. And I agree that Iveta brought something new... she was gorgeous and her dancing was fantastic... But personally I thought she was kind of boring, when speaking (which she hardly does, she just smiles and say "yes"). Her personality does shines through her dancing though... I actually though they would keep her instead of Ryan. I'm so glad you've started watching Misfits! I love the hell out of that show. Favorite characters? And that reminds me... I need to finish organizing my GV badge collection. I've gotten behind on adding them to my post. Those three are my favorite too, though I really grew to love Alisha over Season 2. I really want to see Season 2... perhaps next week I can manage to do that! yourmindisfancy has some great Misfits icons. Also Glee icons, actually. :D Also letsey_x. Which reminds me... prepare yourself... I need an icon of Sam Evans. I sort of adore him now. Really?? Sam Evans? What made you change your mind?? (not that I'm complaining because you know I kind of adore him too). I don't know. I never hated the character. I just thought that they could have done more with him. He bored me for a long time. I've been re-watching the last half of the second season and I like all of his little geek moments. And I love the idea of him with Mercedes. Still don't ship him and Kurt (though I'm cool with people who do), but I like him. I also have a Klaine bunny that's bugging me tonight. Can you see me wanting to write a fic?? Something sort of silly or something serious? see Blaine "flirt" with another guy? Maybe different views on what they're life is about? Like Kurt wants to go Broadway, while Blaine would rather go study something "real"
<3 Misfits! It is very... unique. I am shocked that they sent Nick home.